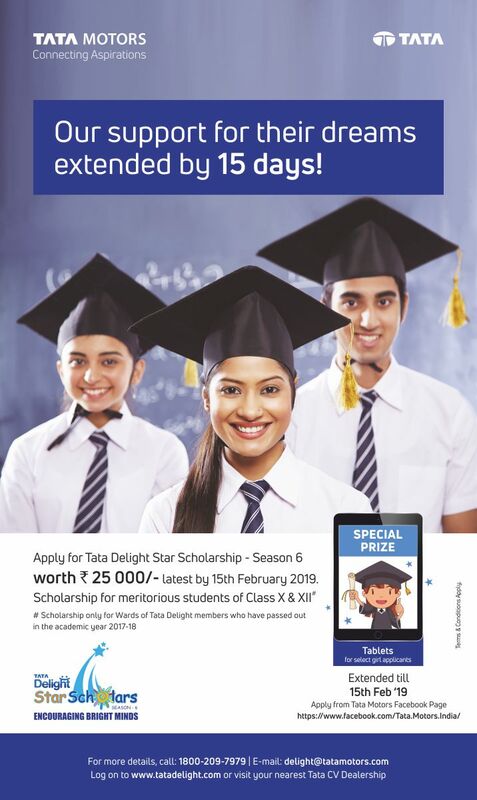 TATA Delight Program offers cash scholarships based on academic performance, per year. All TATA Delight loyalty program members can apply for scholarships for their children by filling a form and attaching the mark sheets as a proof of academic achievement. Enrolments for season 6 have started and will continue to be open till 15th February, 2019.This Year’s program offers cash scholarships of Rs. 25,000 and additional Special prize of “Tablet” to select girl applicants. Fill in the details & attach all the necessary documents with the form. or mail to TATA delight Program Center, Result Services Private Ltd., 8, Balaji Estate, Guru Ravi Dass Marg, Kalkaji, New Delhi – 110019. Scheme period: 15th December, 2018 – 15th February, 2019.